BULAWAYO, Zimbabwe, Aug 13 2018 (IPS) - Many in Zimbabwe are questioning whether the country can break with its horrid past or embrace a new future after a watershed election that saw Emmerson Mnangagwa win the presidential race by a narrow margin and the opposition lodge a formal petition challenging the results in the Constitutional Court. Mnangagwa–a trusted and past enforcer of former president Robert Mugabe–won the vote by 50.8 percent against the 44.9 percent garnered by Nelson Chamisa of the Movement for Democratic Change (MDC-Alliance). Mnangagwa’s 2.46 million votes, against Chamisa’s 2.15 million, gave him the mandatory 50+1 percent required to be declared winner. But the MDC-Alliance on Friday afternoon, Aug. 10, lodged a petition with the Constitutional Court of Zimbabwe challenging the results, halting the inauguration of Mnangagwa that had been slated for Sunday, Aug. 12. “The future of Zimbabwe lies in a negotiated settlement now because of what the country stands to lose [rather] than gain if a political resolution is not found soon.” -- Political analyst and human rights activist, Effie Ncube. Political analyst and human rights activist, Effie Ncube, says that should the court rule in favour of Chamisa and order a rerun, this could stoke tensions. He says that a preferred solution would be inclusive discussions out of court between Mnangagwa and Chamisa. Mugabe may have been ousted, but his brutal legacy lingers over a country desperate for a fresh start. Zimbabwe’s Jul. 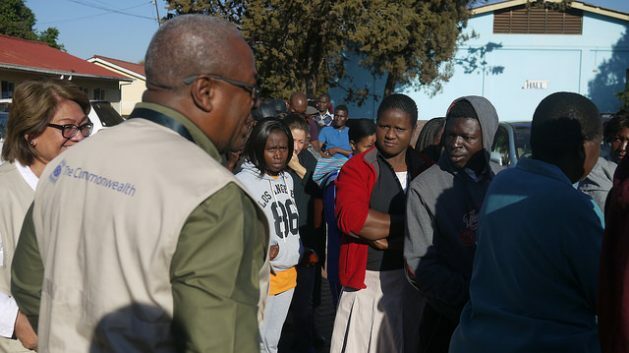 30 elections–the first since Mugabe was toppled last November–did not disappoint on the dearth of harmony. Violence, in all its forms, has been emblematic of Mugabe’s rule and is something that president-elect Mnangagwa sought a clean break from. Two weeks ago police clashed with opposition supporters who staged a demonstration outside the offices of the Zimbabwe Electoral Commission (ZEC) over the delayed announcement of the presidential election results. The army fired on protesting supporters, killing six people and injuring scores more. The tragedy stained the polls despite pleas from both the ruling Zimbabwe Africa National Union-Patriotic Front (Zanu PF) and the opposition MDC for a violence-free election. Nkomo says the credibility of the electoral process has been severely eroded by issues around the voters roll, postal voting and election results. In spite of the violence that has marred the election outcomes, Zimbabwe was banking on a smooth assumption of power as a ticket into the fold of the international community.